The Italian Greyhound, or IG or Iggy as they are often called, is an old breed. Miniature greyhounds have been found in 2,000 year-old digs from Turkey and Greece. Although its original purpose is lost in the mists of time, the original Italian Greyhounds probably served as a hunter of small game as well as a companion. By the Middle Ages, the breed made its way to southern Europe and was very popular among the aristocracy, especially in Italy – thus the name. The IG found many fans among the nobility when it arrived in England in the 1600s. Royal owners included Mary, Queen of Scots, Charles I, James I, and Queen Victoria. They reached a peak of popularity after the World Wars in England, when dog breeding became unaffordable for most people. American breeders are credited with saving the breed. 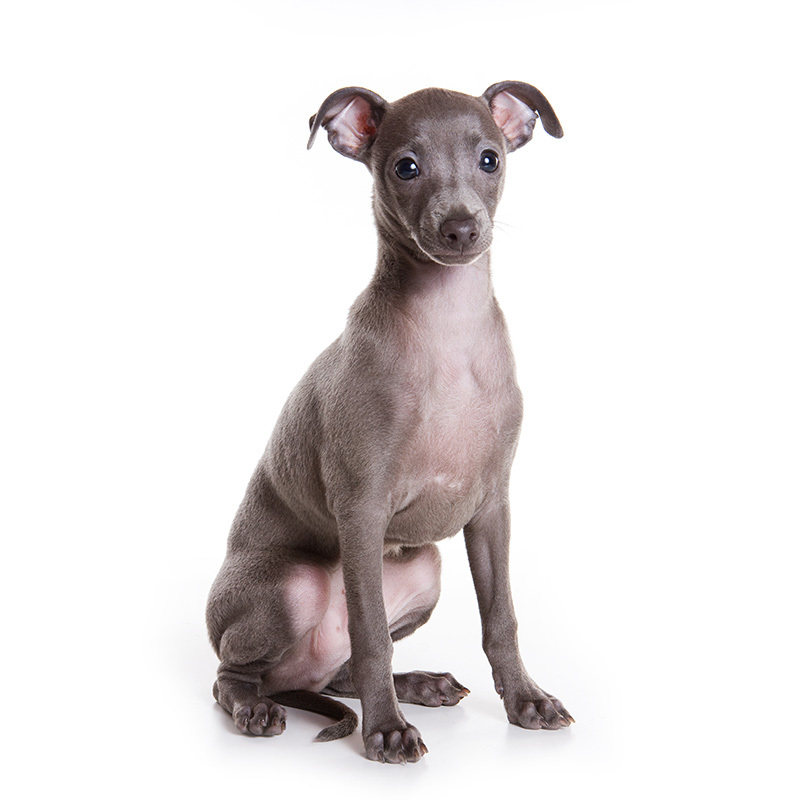 The Italian Greyhound is sensitive, alert, smart and playful. They are an in-your-face breed: sweet, peaceful, gentle, opinionated, manipulative, charming, curious, comical, happy, and affectionate. They have no greater desire than to be the center of your attention. Your IG will be extremely affectionate with family, but may be quite shy with strangers. Italian Greyhounds still have hunting instincts and will chase anything that moves, including cats. They can run up to 35 mph. However, since their body fat amounts to nearly nothing, they prefer to be on a rug near the fireplace. Italian Greyhounds usually weigh between 7 to 15 pounds and stand approximately 13 to 15 inches tall. Their build is quite slim and fragile, especially their legs, which are easy to break. Their coats are very short and come in colors ranging from black to gray to red and cream. IG’s are relatively slow to mature and are notorious for displaying puppy tendencies well into their third and fourth years. You will want to stock up on doggy sweaters for this slim dog as he does not fare so well in the cold. As fragile as they are, broken bones are common, especially the bones in the front legs.